It seems Nintendo are half-scrapping the idea of controllers with sensors, as they prepare to bring out their second edition of the Wii console, the Wii U. Named at E3 2011 a year back, the Wii U console is said to be a more for core gamers, which hints at the idea Nintendo will be bringing in some big names to their console. Even though Nintendo shipped about 90 million Wii units, there were huge problems when it came up against the two largest gaming consoles, the Xbox 360 and PS3. The lack of core games, the lack of entertainment and poor access to other media content made people lose interest with the console after a few weeks. Another major problem with the Wii was that it was underpowered compared to the two other consoles, it had a slow processor, moderate graphics and the sensor controller was sometimes laggy. The whole experience after a few minutes felt rather shoddy. Nintendo has stated that the Wii U has; “3GHz quad-core Power-PC-based 45nm CPU that’s very similar to the Xbox 360’s CPU.” – even though this is a powerful CPU, it doesn’t really push the boundaries of speed and excitement. The Wii U might match this generation of consoles but how will they match the next generationof the Xbox and Playstation? Many developers have stated that the Wii U won’t be as powerful as the Xbox 360 or Playstation, but some have said this is ludicrous and the Wii U will be more than capable of matching up to the other two consoles. Taking it for a test drive at Gamescom seems to reveal to many that the Wii U is a powerful console, capable of matching and even surpassing the other consoles’ speeds. Instead of the two stick-like controllers that came with the previous edition of the Wii, the Wii U will come with one handheld controller that seems to be a modern take on the Nintendo DS. The controller has the traditional four action keys, four movement keys and two analog stick design that is on the PS3 and Xbox 360 controllers, but also comes with an enabled touchscreen screen that also acts as a gaming screen. With the controller being handheld, you may question if the Wii U is more a competitor for the Playstation Vita, but Nintendo have silenced these questions by revealing you must always have the Wii U main-box online to keep the controller working. You can turn off your TV and just play the game with the controller however, allowing it to be much more portable than the Xbox or PS3. 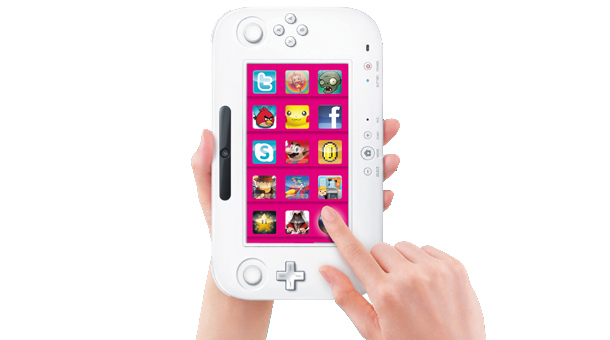 The touchscreen can act as a multi-touch tool and some developers have stated their game will not or will be enabled to work with the Wii U’s touchscreen. The capacitive display also brings the mobile/tablet element into the game, which hints that you may be able to port apps onto your Wii U console, like Angry Birds and Temple Run. 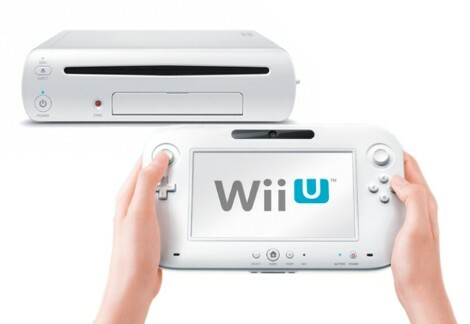 The Wii U console is to run on 1080p graphics, which translates to top-end graphics output. HDMI ports will be included on the console, as will a SD card and USB ports. While there has been no confirmation, it seems the Nintendo Wii U is going to still use the disc format and not go fully digital. According to a Nintendo executive, there will be 25GB’s of disc format data storage, but it will not run blu-ray discs. The Wii came with a lacklustre amount of core games and entertainment apps, as Xbox especially ramp up the usage of apps like Netflix, Last.fm, Facebook and other media apps, it is imperative that Nintendo make an App Store or some area to download some of our favourite apps. It is more imperative however that they get some good core games, Assassins Creed III, Black Ops 2 and GTA5 would be grand, but what we need to see is developers wanting to use the Wii U as their first console, we want exclusive content that Xbox and PS3 are not going to get, and with this new multi-function controller might be the key to this. At all the gaming conferences, Ubisoft, EA and other top names have been showing off their new and best on the Wii U, showing that we will be seeing a good range of core games on the new console, with additional features to be more compatible with the controller. The Wii U is said to be released late 2012, possibly close to Christmas time to make the most of the Christmas sales boost, the idea is it won’t come out any time after the fourth quarter of 2012, but nowhere earlier than September.